I participated in another Cellarpass Tv Live show. This weeks show was a Wine Country Fashion Show & Wine tasting. I’m not a huge fashion fan but I could see the ladies were having a great time. With winter around the corner we have to start exchanging our summer clothes for the fall winter wardrobe. I cannot believe how fast the summer came and gone. I’m not looking forward to winter. We can only hope its short! Pale color depth and a gold hue. Young-fruity aromatic notes of buttery, creamy, lemon, citrus, tropical fruit. Dry, full-bodied with balanced acidity. Silky-creamy mid-palate flavors with a soft silky finish. Region/Appellation: Sonoma Coast, Russian River. 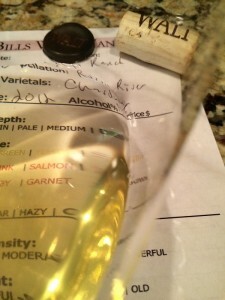 I rated the 2012 WALT “Dutton Ranch” Sonoma Coast Chardonnay four glasses. The Chardonnay was really good. We saved it for the next day and enjoyed it again.